Heat coals or gas grill for direct heat. Place potato wedges in microwavable dish. Add 2 tablespoons water. Cover and microwave on High about 4 minutes, stirring once, just until potatoes begin to soften; drain. Thread potatoes, chicken, sausage and bell pepper alternately on each of six 12-inch metal skewers. Mix remaining ingredients. 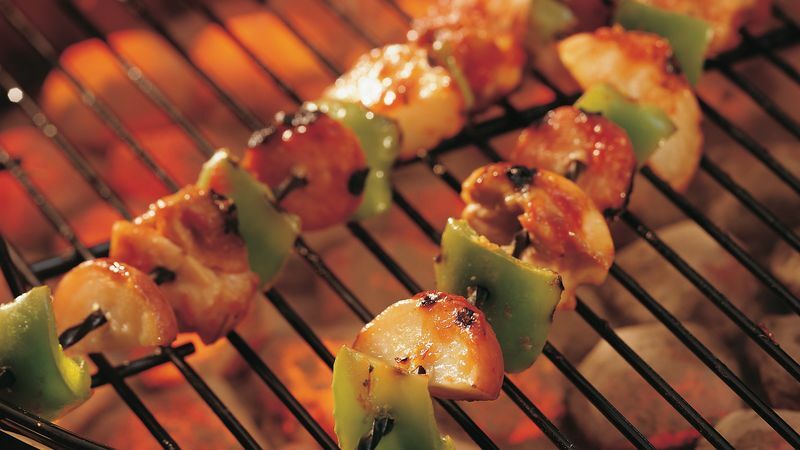 Cover and grill kabobs 4 to 6 inches from medium heat 15 to 20 minutes, turning kabobs 2 or 3 times and brushing with chili sauce mixture during last 5 to 8 minutes of grilling, until chicken is no longer pink. Boneless skinless chicken breasts can be used instead of the thighs. Instead of the new potatoes, try using refrigerated potato wedges. You can omit the microwave cooking step because these potatoes are partially cooked. Serve the kabobs with rice and crusty French bread.